Tennessee Get Its Own Super-Heavy, Laboratory-Synthesized Element "Tennessine"
Tennessee will probably join California as the only U.S. States with their own element. Every once in awhile, the 250-year-old periodic table of elements gets an upgrade. With the latest revamp, we get an element named for the American state best known for country music and Jack Daniels Tennessee. New elements aren’t very common, and when they’re discovered scientists at the International Union of Pure and Applied Chemistry get to moderate the debate over naming a new building block of the universe. In June, the IUPAC announced the provisional names of four new elements. Now, it’s official — element 117 is now known as tennessine. On the list alongside the Volunteer State are elements named for Japan, Moscow, nuclear physicist Yuri Oganessian. The name nihonium and symbol Nh for element 113. The name moscovium and symbol Mc for element 115. The name tennessine and symbol Ts for element 117. The name oganesson and symbol Og for element 118. Yes, tennessine. 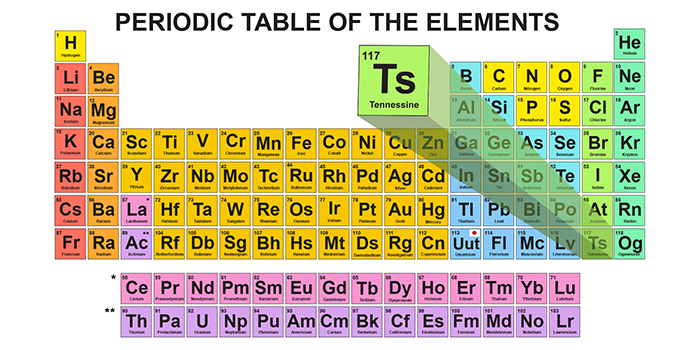 It may seem like a surprise out of context, but element 117 owes its existence to Tennessee. All elements after number 94 are lab-created combinations of protons, neutrons, and electrons that can’t be found in nature (scientists think numbers 95-100 might have existed naturally at some point, but haven’t found them outside a lab in the present day). Tennessine was created by a joint effort of some of the state’s biggest scientific institutions — Vanderbilt University, the University of Tennessee, and the Oak Ridge National Laboratory, all the way back in 2010. The Flerov Laboratory for Nuclear Reactions (FLNR) in Russia and Lawrence Livermore National Laboratory (LLNL) in California also pitched in, but the bulk of the work on mashing together 117 protons and neutrons into a nucleus was done in Knoxville, Nashville, and Oak Ridge, Tennessee. And when we say mashed together, we mean mashed together. Here’s a rendering of what element 117’s super-heavy, super-dense nucleus looks like. It's a little crowded in there. And Tennessee’s in pretty exclusive company — the only other U.S. state with its own element is California, who got element number 98, Californium, named after the state and University after its discovery in 1950. Japan also gets its own element, nihonium, number 113 after Nihon, an alternate reading of the kanji for “Japan,” that’s more commonly read as “Nippon.” Nihonium was discovered by a Japanese research team, while 115, 117, and 118 were all discovered by the same U.S. and Russian collaboration. The Russians get 115, moscovium (after Moscow, of course), and 118, oganesson, named after the aforementioned Yuri Oganessian. Tennessine falls into the noble gasses (hence the -ine suffix), and rounds out the bottom row of currently-known elements, but future atomic gamblers can always try again when element 119 comes around.